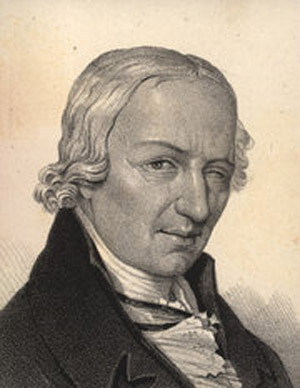 Johann Bode was a German mathematician and astronomer best known for his popularization of an empirical mathematical rule giving the relative mean distances between the Sun and planets. Often referred to simply as Bode's Law, this rule had been discovered earlier by Johann Titius (1729–1796) of Wittenberg and so is more properly called Titius's Law or the Titius-Bode Law. Bode founded the Berliner Astronomisches Jahrbuch (Astronomic Yearbook of Berlin) in 1774, and went on to compile and issue 51 yearly volumes of it. From 1772 to 1825 he was astronomer of the Academy of Science, Berlin, and from 1786, director of the Berlin Observatory. His most important contribution to astronomy was the Uranographia (1801), a collection of star maps and a catalogue of 17,240 stars and nebulae – 12,000 more than had appeared in earlier charts. Bode enthusiastically endorsed an extreme form of pluralism and natural theology. He argued, in two influential texts on astronomy – his Anleitung of 1768 and Erlauterung of 1778 – that essentially every significant object in space, including the Sun, stars, planets, moons, and comets are inhabited by rational beings (see plenitude, principle of). For him, habitability was "the most important goal of creation" (see teleology). Concerning the key Christian issues of incarnation and redemption, he suggested that extraterrestrials everywhere "are ready to recognize the author of their existence and to praise his goodness." As for objections against the habitability of planets too far from or close to the Sun, he replied that varying atmospheric conditions compensate for the different levels of solar radiation in order to make life possible, and further noted that "the rational inhabitants, and even the animals, plants, etc. of the other planetary bodies are characterized by forms different from those which occur on our earth." This flexibility was especially important in his argument for life on comets: "Who can conceive what special arrangements of the wise Creator in regard to the climate, zones, dwelling places, sectioning of creatures, natural products, may not be expected for all those on a cometary body?" Concerning the Moon, he cited Schröter's reports of changes on the lunar surface which "may indicate natural upheavals and a culture perhaps organized by its inhabitants" (see Moon, life). Bode was among the earliest advocates of the much wider cosmos, with its "island universes" (external galaxies), envisaged by Immanuel Kant and William Herschel.